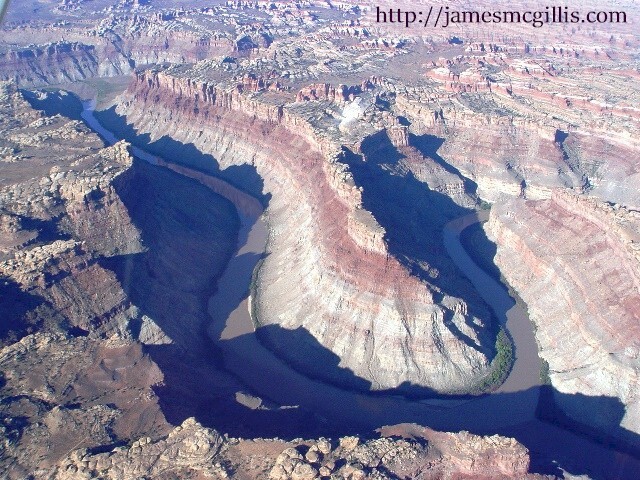 By the time the Colorado River passes Moab, Utah, it already carries a heavy load of minerals, trash and sewage. By mid-summer, water levels drop, exposing driftwood, sewage and trash along the shore. Only the next spring flood will loosen these stinking mixtures of organic material and plastic from the shoreline. In 2014, when I saw methane bubbles rising from one such stinking mass, it opened my eyes wide to the damage already done to this once great river. After skirting the Matheson Wetlands along one bank and the Moab Pile on the other, the Colorado River descends through the Portal and on to a place called Potash, Utah. 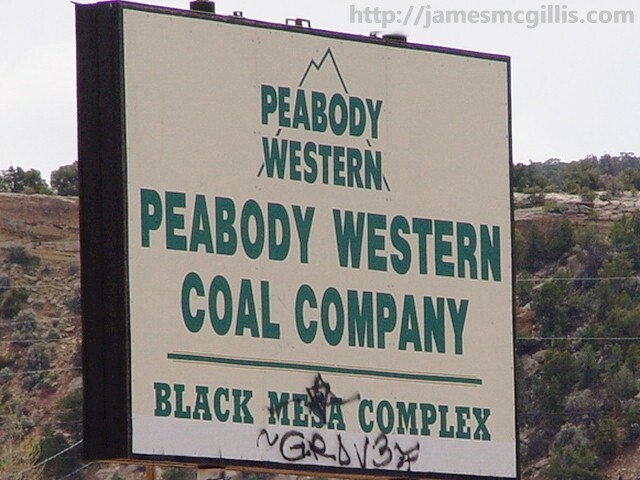 To make potash sound more interesting, the owners of the Cane Creek Potash Plant named themselves "Intrepid" Potash-Moab, LLC. 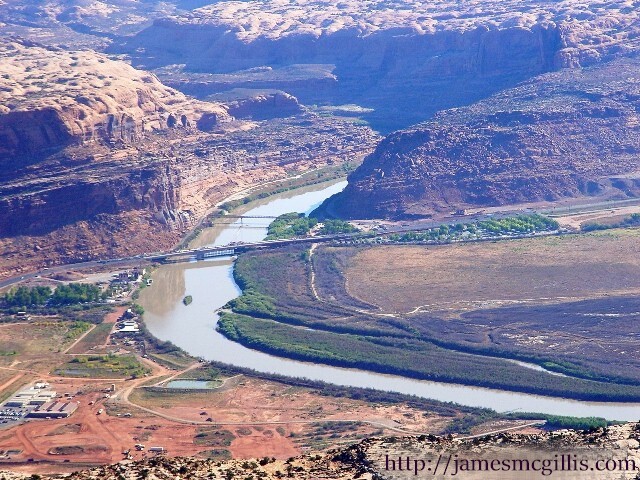 Using dubious and undocumented Colorado River water rights, Intrepid Potash-Moab infuses millions of gallons of river water annually into the Cane Creek Anticline. After injection, the anticline collapses ever so slightly. This subsidence burps out untold acre-feet of a brine solution, which is rich in potash salts. After drying and processing, Intrepid-Moab ships the resulting product out via rail and interstate highway. Later, agents and retailers resell the packaged product to farmers and home gardeners. The success of the corporate farming, as we know it today depends on finished potash and other synthetic fertilizers for its success. Intrepid-Moab uses solar power to dry its potash brine in shallow, lined ponds. These ponds cover many colorful acres of bench land overlooking the Colorado River. From the Potash Road, four-wheelers access the Shafer Trail by traversing through the Cane Creek Plant. If terrestrial scenes of chemical degradation and poor stewardship of the land are not enough for you, I suggest an air tour of the area. 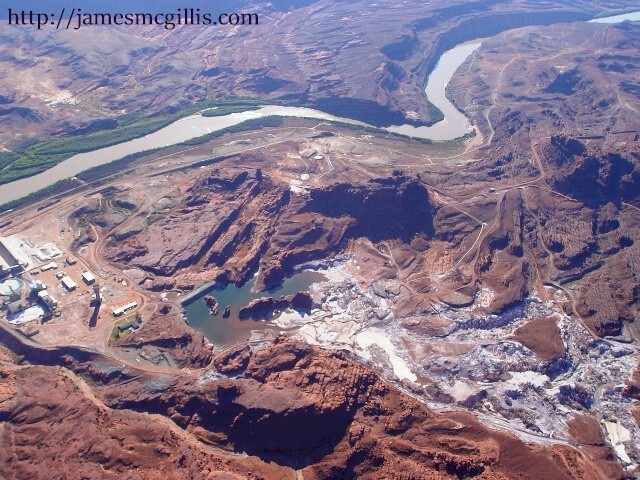 On a Redtail Aviation flight out of Moab’s Canyonlands Field several years ago, our pilot banked the plane sufficiently for me to capture some revealing photos of the Cane Creek Plant. Gushing from injection well sites that are high up on the bench land, the upwelling brine cascades unchecked until it reaches the settling ponds below. Any miscalculation of volume could result in overflow of the settling ponds. From the air, you can see a white crust that has dried upon the walls of small canyons leading down to the Colorado River. This tells me that Intrepid Potash-Moab has experienced both overflow and leakage at the settling ponds. Dwarfing any inputs upstream in Utah and Colorado, Intrepid Potash-Moab could be the largest contributor of organic solids anywhere in the Upper Colorado River Basin. After potash spills into the river, it goes back into solution, adding to the salinity of the water and turning the river into an organic time bomb. 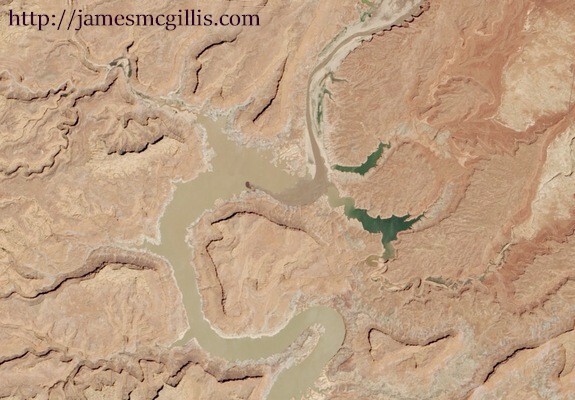 After its confluence with the Green River, the first full stop for the Colorado River is at the upper reaches of Lake Powell in Southeastern Utah. 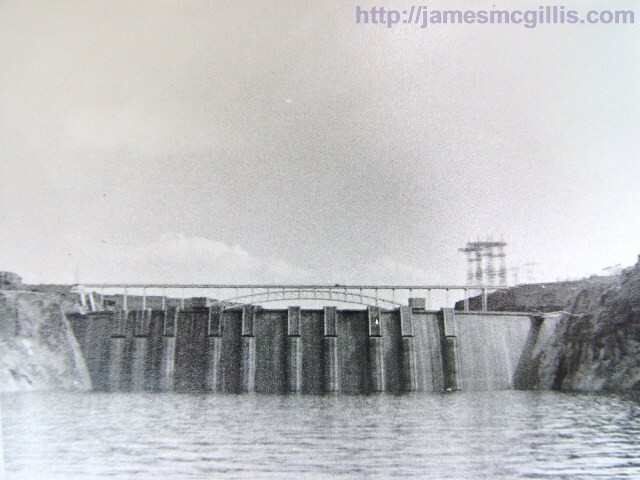 Soon after the lake reached its full potential size in the early 1980s, its water level began to fluctuate and then decline. During the past fourteen years of persistent drought, Lake Powell lost nearly half of its peak volume. Today, optimists might say that Lake Powell is “half full”. Almost unanimously, climate scientists agree that the reservoir is “half empty” and will continue to decline. 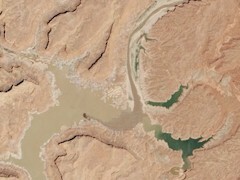 With many miles of former lakebed exposed to sunlight at the upper end of Lake Powell, the environment on those mudflats has deteriorated significantly. As water laden with heavy metals and organic material arrives at the upper end of the lake, it mixes with silt and sand. The result is a phenomenon known as methane volcanoes. Methane gas can be a byproduct of flatulence in cattle, coal mining or the baking of organic mud. Most people are familiar with carbon dioxide as our most ubiquitous “greenhouse gas”. Fewer people might know that methane is fifteen times more powerful as a greenhouse gas than carbon dioxide. Carbon dioxide puts the effervescent fizz in our soft drinks. Methane smells bad, is flammable and if contained, may explode. 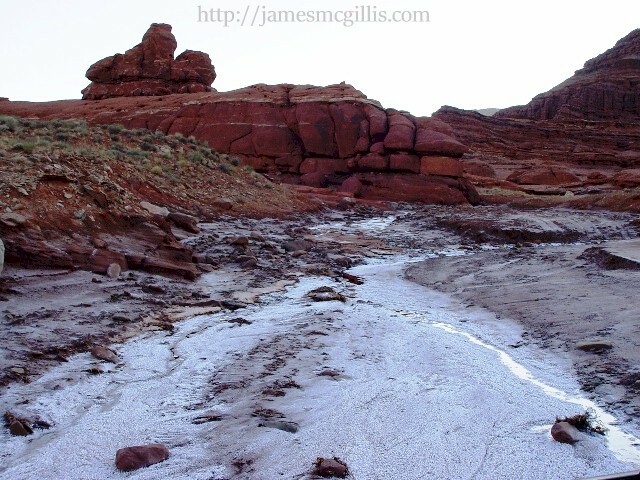 First, the stinking, organic mudflats at the upper end of Lake Powell create and release untold amounts of methane gas. Usually, warm air and light gases like methane rise from the surface and dissipate in the upper atmosphere. Often methane from Lake Powell remains in the lower atmosphere, trapped near the ground by an atmospheric inversion layer. If an atmospheric inversion is present, warm air aloft traps hot and volatile gasses below, thus creating a bubble of noxious air at or near ground level. Not ironically, a huge methane gas bubble now floats above the Four Corners region. Is this unprecedented bubble of volatile gas the result of Navajo Nation coal mining, cattle flatulence or the stinking mudflats and methane volcanoes at the upper reaches of Lake Powell? Personally, I am betting on a combination of coal mining and fertilized mudflats. Thank you for your fertile potash input, Intrepid Potash-Moab, LLC. After flowing over and sifting through the mudflats, the Colorado River enters many miles of forced confinement between sandstone canyon walls. There it drops its remaining sediment to the bottom of what once was a desert garden of legendary beauty. 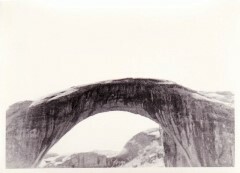 Known as Glen Canyon, living humans who saw it in its untrammeled glory are now few and elderly. Only through old black and white photographs and essays by such writers as John Wesley Powell and Edward Abbey do we know about a place once visited only by dory boat or river raft. Once the water in Lake Powell reaches the penstocks and electrical turbines at Glen Canyon Dam, it is cold, dark and nearly devoid of oxygen. 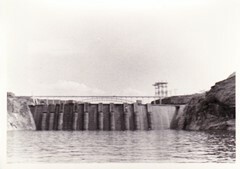 The portion of lake water that rests below the deepest intake on the dam, we call the “dead pool”. The lake water in the dead pool is as near to dead as fresh water can be. Once released downstream, dam water is clear, cold and capable of supporting no life higher than green fronded algae. Such algae grow wherever the water flow is slow enough to support life. If Colorado means, “colored red” or “Red River”, immediately below Glen Canyon Dam, that name does not apply. Running clear, cold and fringed with green algae, its name should revert to “Green River”. This is Part 1 of a three-part article. To read Part 2, please click HERE.